After a Level 1 incident was announced upon the disclosure of two deformed fuel rods which were stick together at the Kashiwazaki-Kariwa nuclear power plant, TEPCO investigated 65 spent fuel assemblies at the Unit 5 spent fuel pool and discovered that 18 of the 65 assemblies were found to be bent. 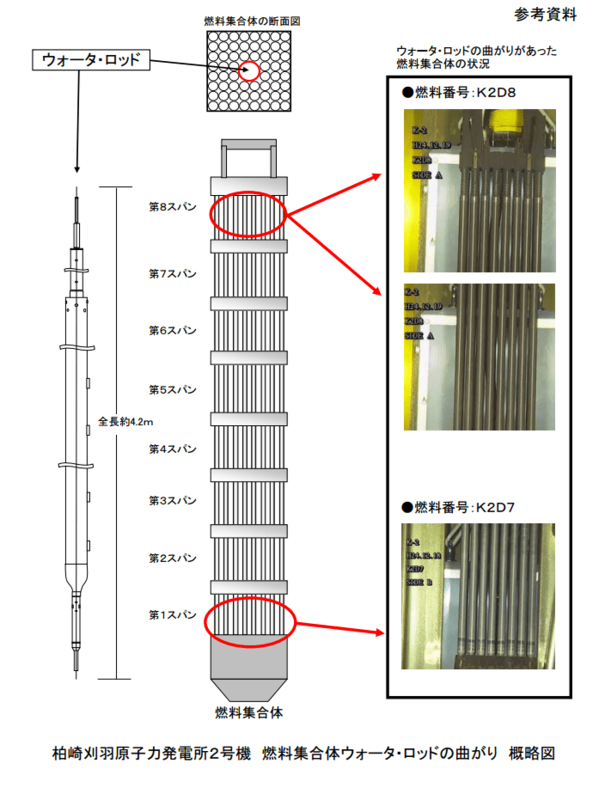 Of the 65 rods, TEPCO found some where deformation was found in the weaker areas on the lower parts of the rod where the strength is relatively low compared to other parts, but none of the holes had completely closed. They also discovered that some of the fuel rods adjacent to the deformed water rods were now touching or closer to one another in the rack. As a result of inspecting 31 fuel assemblies in Unit 2, part of the 2 spent fuel assembly water rods were found to be bent (approx. 1.5cm). TEPCO assumes that the water rods were bent because of the excessive force applied while installing the channel box.